A First for Everything : Welcome team! This is my current classroom for the 2013-2014 school year. 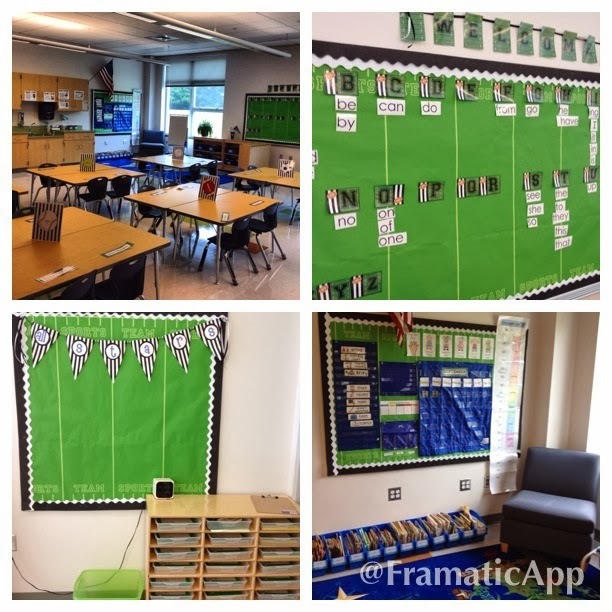 I try to stay in the same color scheme every year because I think it makes the classroom look neater and more well organized. Schoolgirl Style has wonderful classroom themes! This is the "Totally TEAMwork" collection. My word wall, the "All Star" bulletin board, and my calendar are the only bulletin boards I have in my classroom and I am TOTALLY ok with that! As it stands, the word wall is really a white board that I covered to brighten the room up a bit. The table signs, nametags and book bin labels, as well as my calendar display are all from the Totally TEAMwork kit I purchased from schoolgirlstyle.com. The only exception is the sports theme bulletin board background paper which I purchased from Amazon. Overall, it was worth every penny of the $40 because I cannot stand shopping all over the earth for little tidbits here and there only to find our that they are a shade or two off. I'm sure my husband is grateful too as he tends to get dragged along on those type of adventures. Anywhoose.....I get a TON of compliments on my classroom decor and I love the simple color scheme. It's going to be hard to top this but I'm sure I'll find something just as cute on the site for the next school year. I also have an IKEA near me and that place could make me broke, I tell ya!